Love this set! This is a heavy chipboard shadowbox made to fit the back of a shabby chic white wooden picture frame (both parts are included). Hint: remove the metal hardware on the back of the frame so the shadowbox can be glued flat to the back of the wooden frame. 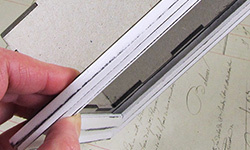 And a further hint from Teri Calia: if you use the glass that came with the frame, use sticky-back velcro to attach the shadowbox to the wooden frame, so you can get into your scene in the future. See Teri's post using the smaller version for a how-to. Pretty tiny (the inside shadowbox is approx. 3-1/4" x 4-3/4" and 2" deep). You can use the shadowbox tall or wide orientation. Set of 2 pieces (wooden picture frame and flat chipboard kit to build the shadowbox). 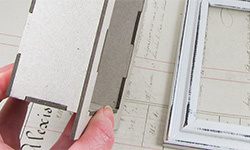 Design Team Member Nichola Battilana made The Collector's Room Box (see the wide photo below). More info in the blog and/or see the supply list.